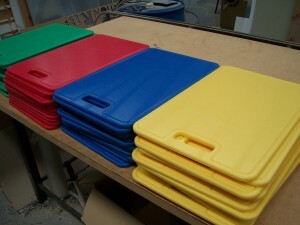 Polyethylene is the most widely used polymer. It is characterized as easily processable, economical, tough and light weight with excellent chemical and gamma ray resistance. It also has low moisture absortion, good impact strength, a low coefficient of friction, and excellent low temperature and electrical properties. It is available in several different grades with a variety of properties. Some are flexible, others are rigid; some have more impact strength, and while some have good clarity, others are opaque. weight (UHMW-PE), falls into the high density category. HDPE sheet has very low friction properties which are some of the best in the Engineering Plastics range. HDPE sheet also has great abrasion resistance meaning longer lasting life of parts. HDPE absorbs low amounts of moisture which help create components that are stable over long time periods. HDPE is Food Standards Australia approved for use within the food manufacturing industry. Its low cost and excellent impact strength make this material an excellent choice for low cost components. • Blow molded bottles for milk, juice, water, etc. Call us for a free quote (03) 9798 1153.